The purple one! Aluminum-to-Copper connector provides a secure connection while preventing aluminum corrosion. Specially formulated corrosion-resistant compound provides cooler connections and increased conductivity. You have a tough job. IDEAL, the leading brand in twist-on wire connectors, makes it easier with our tough and dependable line of UnderGround Wire Connectors. These harsh-duty wire connectors have been designed specifically to handle wire connections exposed to direct bury/below grade conditions. 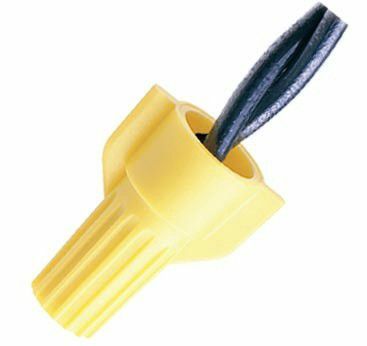 CE Winged Wire Connectors Yellow Qty 20 Connect and insulate 2 or more bare copper wires with the Winged Wire Connector. The contoured wing design offers a maximum level of torque, and the deep skirted flame-retardant shell helps provide long-lasting use.